I lost count! Maybe 10 years??? I gravitate towards pinks and greens but when I stamp Asian themes I go for bolder complementary colors. I did a challenge last year using analogous colors and I want to try more of that. Anything I can color, nature scenes, geisha, flowers. The Fiskars cutter with the guide wire, since there are times I can’t even cut a straight line with a cutter! If creating feeds your soul, try to make the time to create. I have not yet succeeded at this, but I’m trying! I have always been enamored of Asian art. I am drawn to its intricate simplicity. Whether an Asian brush painting or the vibrancy of a kimono, I find them inspiring. I don’t subscribe to any magazines. I browse OSA, Splitcoaststampers and Pinterest if I want to learn something. If I purchased magazines this would take time away from stamping. I make jewelry, love to cook, garden and I am owned by 2 Jack Russell terriers who compete at trials. If I see a color combination that delights my eye, the ideas start tickling my brain. I took a drawing class in college, but that is about it. According to my dogs, I am their personal valet, doorman, cookie dispenser, etc. They believe that during their waking hours I should be “on call” at the drop of a toy. I am married and have my fur kids. I grew up on Long Island, but I am happier in the quiet and slower pace of Connecticut. FYI: When I leave a comment in an OSA album I am a1terriermom, I sign my cards philsmom, I may have an album lurking out there as bacismom. This was the result of my getting hacked, so I had to change user names and passwords. It has been brought to my attention that people didn’t know I was a1terriermom . I recently learned of an art form called Kintsukuroi and I was also inspired by a Henry David Thoreau quote, “It’s not what you look at that matters, it’s what you see.” So inspired, I purchased Framelits Die Set 4 Pack with Stamps Frames by Graphic 45. “Kintsukuroi (keen-tsoo-koo-roy) is the Japanese art of repaired pottery. But it’s something more than that. An important something. When a potter makes a bowl, he makes it by hand with malleable clay. The bowl is formed to the potter’s liking, then fired to a couple thousand degrees. Afterwards, it is finished and presented as a true work of art. Now, let’s say the bowl broke. Would you even consider repairing it, let alone consider it more beautiful for having been broken? Of course not! We (especially in the Western world) demote and dishonor it, throwing it out in the trash. But others would not only repair it, but also elevate it to a whole new level of appreciation. We’ll have to go back to mid-1500 Japan for that. The story is told of a bowl that was much loved by a military ruler. One day during a gathering, a servant accidentally dropped the bowl, which broke into five pieces. Everyone paused, fearing for the young man as the military leader was known to possess a quick, harsh temper. Then one of the guests improvised a comic poem about the incident, provoking laughter all around and restoring the leader to good spirits. My homage to kintsukuroi because it’s not what you look at that matters, it is what you see. 1. On black base layer stamp in Brilliance Galaxy Gold, Stampabilities Scratchy Texture and emboss with Ranger Queen’s Gold embossing powder. 4. 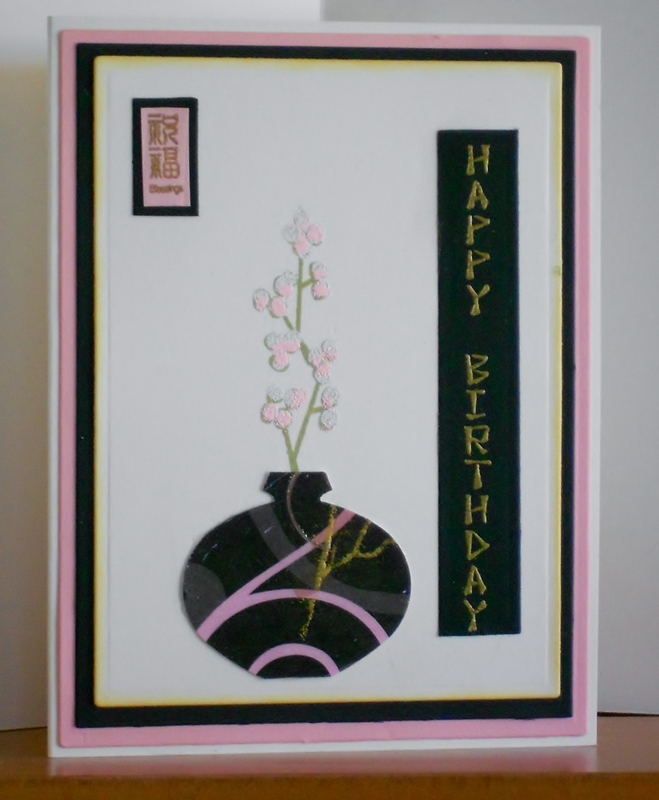 On white layer, stamp Stampabilities Orchid Greetings in Versafine Onyx masking the pot. Emboss with clear embossing powder. 5. 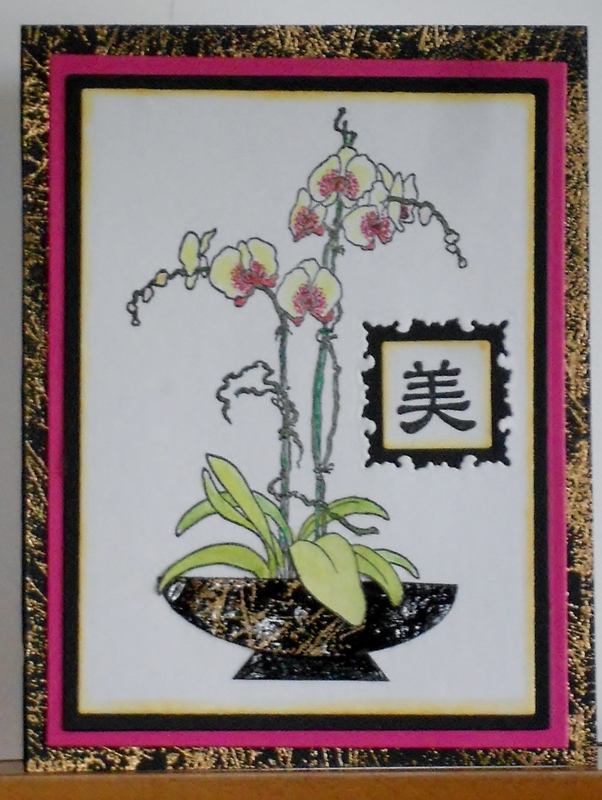 On a scrap piece of white cardstock stamp the leaves of the orchid plant and emboss with clear embossing powder. 6. After coloring cut out the leaves that would be obstructed by your cache pot. 7. Sponge Gold ink around perimeter of white cardstock. 8. Using an oval die cut out a cache pot in black and use a scrap for its base. 9. Mask some of the Scratchy Texture stamp and stamp on the cache pot in gold and emboss with Gold embossing powder. 10. Cover cache pot with Clear Glossy Accents. 11. Stamp in black and clear emboss on white your sentiment. 12. Cut aperture with Fleur de lis square for the sentiment. 13. Color image and layer the cardstock as you’d like. I really like the story of Kintsukuroi and the card with the ‘mended crack’ is just wonderful, never heard of this story before. mmmmmm….this could be a topic for a mingle in the future. congratulations, Fran. Love the story about Kintsukuroi; hopefully, it will be a swap/mingle in the future. Beautiful project. Absolutely stunning art, Fran. I’m delighted you were selected as SAM for June to share your talents and provide a history lesson on Kintsukuroi. Congratulations Fran! Your project is beautiful and I loved learning about Kintsukuroi. Congrats Fran, your project is divine..love the story too. Lovely, lovely project, Fran! You rocked it! So enjoyed reading your bio and learning more about you! Enjoy your month in the limelight! TFS and Congratulations on being SAM…know you will enjoy your well deserved month! Your project is STUNNING, and I thank you for the inspiration and Kintsukuroi history!